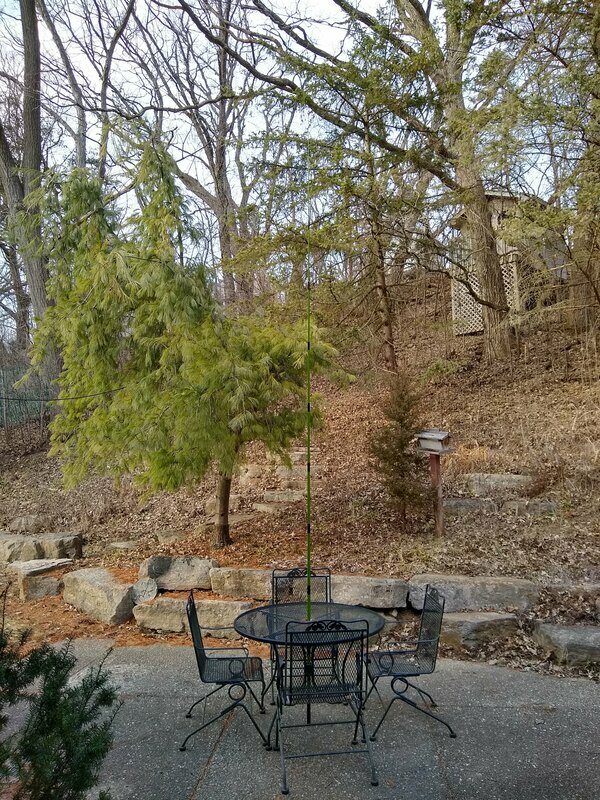 2019-03-27 The three pictures below show the two ends and center support mast of my EFHW 59 ft 40/20 meter inverted vee. The wire used for the radiator barely shows because it is so small, approximately 26ga or so. I use shock cord on both ends so everything has some flexibility. This evening I checked into the 4SQRP 40 meter CW net with it. The Net Control gave me a 449 and he was a 559 in here from 582 miles south west in Oklahoma. In addition I have made eight 5 watt QRP contacts in the last few days with it set up in a slightly different location. One of those was 1695 miles, SSB on 20 meters. The mast which is mounted through the patio table where the umbrella should be is 14-1/2 feet tall. 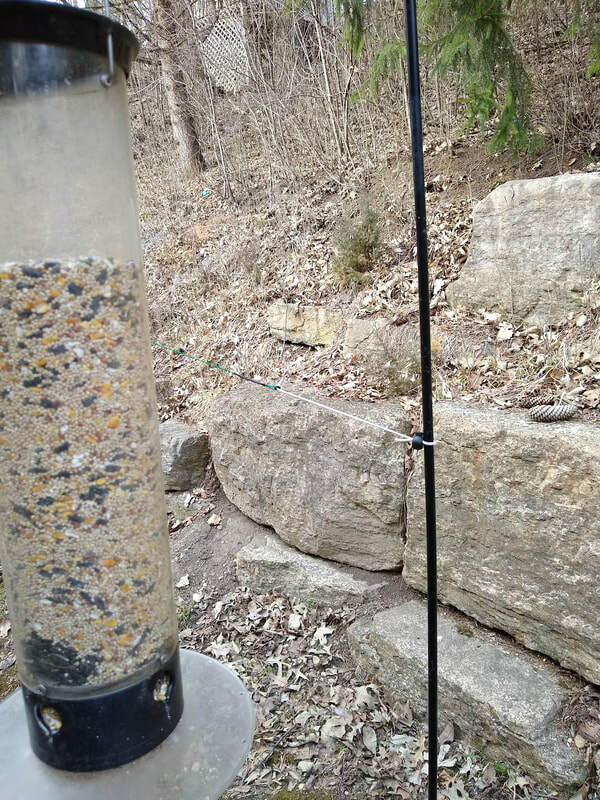 The antenna, including the 15 foot fiberglass push up mast works well, is very light and easy to put up, especially if you can stick the mast into the umbrella hole of a picnic table! The half wave end fed antenna is simply a half wavelength wire fed at the end rather than the center like the half wave dipole. The impedance of half wave dipole at the center feedpoint is close enough to 50 ohms to simply attaching a 50 ohm coax from it to your radio. Very convenient and simple. However for portable operation the extra length of coax needed to go from the elevated center of the antenna to your radio can be inconvenient. Hence the desire to feed it at one end instead. The main issue with feeding a half wavelength wire at the end rather than the center is matching the several thousand ohms impedance to your 50 ohm transmitter antenna terminal. The rest of this page focuses on that issue. There are also some links to resources at the end of this page. A good video regarding the End Fed half Wave Antenna is by Steve Ellington. Click here to watch it. One other note. The difference between the half wave end fed vs. the "random" wire end fed is that the half wave end fed, like a dipole, is only good for one, perhaps two bands. That is a disadvantage. However, that can also be considered an advantage as a half wave antenna is one of the simplest, effective antennas you can build. On the other hand the random wire end fed antenna is more of a compromise in terms of effectiveness or efficiency. But with a tuner it can be used on multiple bands and that capability may be worth the compromise in some situations. Both antennas have their place and do what they do, well. Note that my notes below are arranged in reverse date order with the most recent at the top. So to follow my experience chronologically, start at the bottom! Finalized End Fed Half Wave Antenna using QRPGuys "No Tune EFHW transformer" and 59 ft of Sotebeams light antenna wire cut for 40 meters. It's assembled onto a homebrew wire winder. 2019-03-22 One guy on Facebook suggested that the feed point for an EFHW should be really close to the ground, say a foot or so. So I moved mine down to about a foot. It appears that it lowers the resonant frequency noticeably but not enough to make much actual difference. Mine still has a barely measurable SWR across the entire 40 meter band. 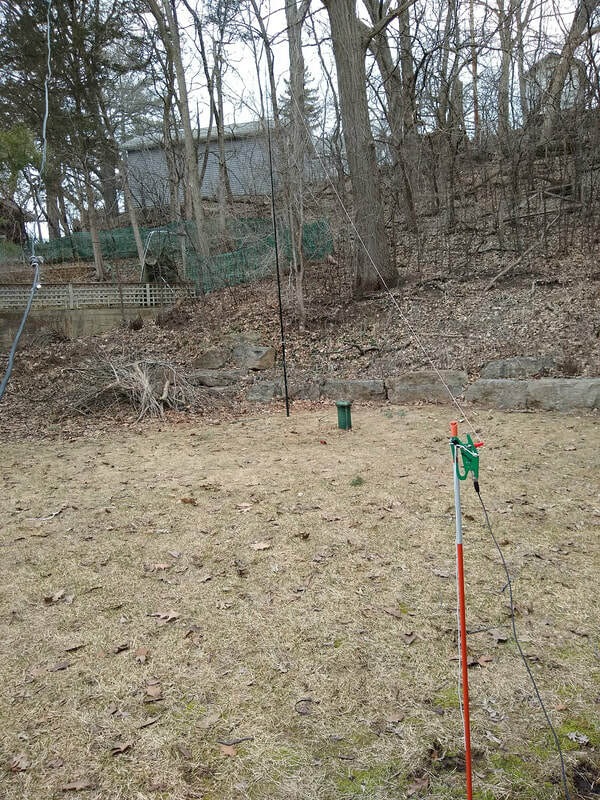 Next I am going to replace my mid point mast with a 14.5 foot one, dropping the peak by about six feet and see what difference that makes. The reason I want to test that is that my most convenient push up mast is 14.6' and collapses down to 22 inches whereas the 20 foot one only collapses to four feet. Obviously the shorter one is more convenient for portable use. As nearly as I can tell with my measuring equipment the six foot lower apex doesn't make any difference at all. I suppose it might make an on-air difference but I'm guessing not. At least probably not enough that one could determine it in actual use. That's good for my purposes! The 20 meter leg also has a less than 2:1 SWR on 12, 10 and 6 meters. How well it will radiate is yet to be seen, but it does not need a tuner. So the 40 meter length has very good SWR on 40 and usable on 20. That along with the 20 meter segment gives coverage of 40, 20, 12, 10 and 6 meters. Only 30 and 15 meters are left out! Not bad for a very simple antenna. 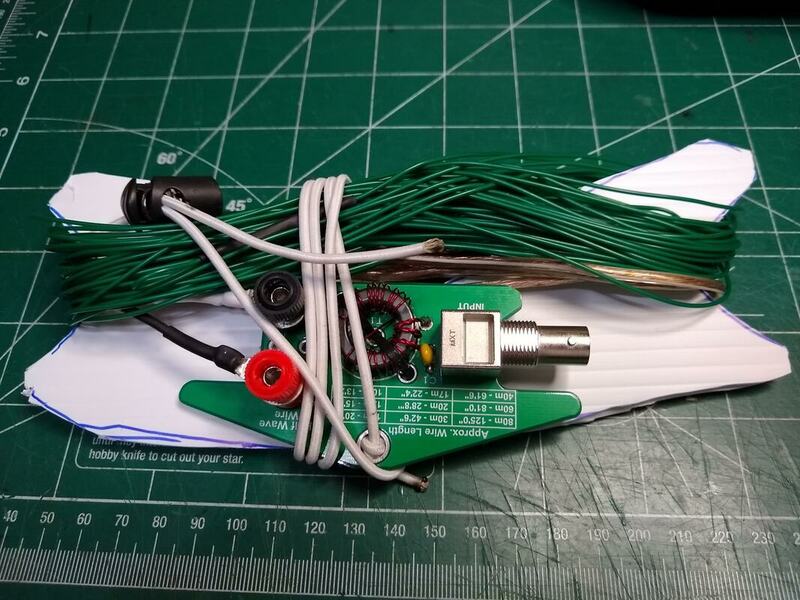 The "finalized" version is cut from SOTABEAMS light weight wire and is NOT broken at the 20 meter length but is one long wire, 59-1/2 ft long. SWR varies from 1:1 at the bottom of the 40 meter band to about 1:2 at the top. That is with a short ground wire to an aluminum tent stake in the ground. Without that ground wire the SWR rises to about 1.5:1 at the bottom of the band and over 2:1 at the top. It does resonate on the 20 meter band with an SWR of about 2:1 across the band. As often happens not too long after finishing the "finalized" version of the antenna I answered a CQ by NC7H in Idaho, 1428 miles west! We were both 559. As usual I was using my x5105 at 5 watts. Not sure what he was using. That was on 14.060 on the 40 meter uncut inverted vee. SWR was about 1.5:1. I'm happy! Here is the current, finalized configuration used for that QSO. The radiator is 59-1/2 feet long. Starts about 3 feet off the ground at the feed end. The apex is atop a push up fiberglass mast 14'6" high and the far end is roughly 3 feet up. I haven't cut it for 20 meters yet (and may not do so as 40 and 20 are the bread-n-butter bands for me). It measures less than 1.5:1 SWR across 40 meters. On 20 meters SWR measures about 1.5 to 1.2:1, highest at the bottom of the band. I found that using a short ground wire to an aluminum tent peg in the ground immediately beneath the 49:1 balun helps the SWR. 2019-03-21a I spent most of the afternoon playing with my end fed half wave antenna. 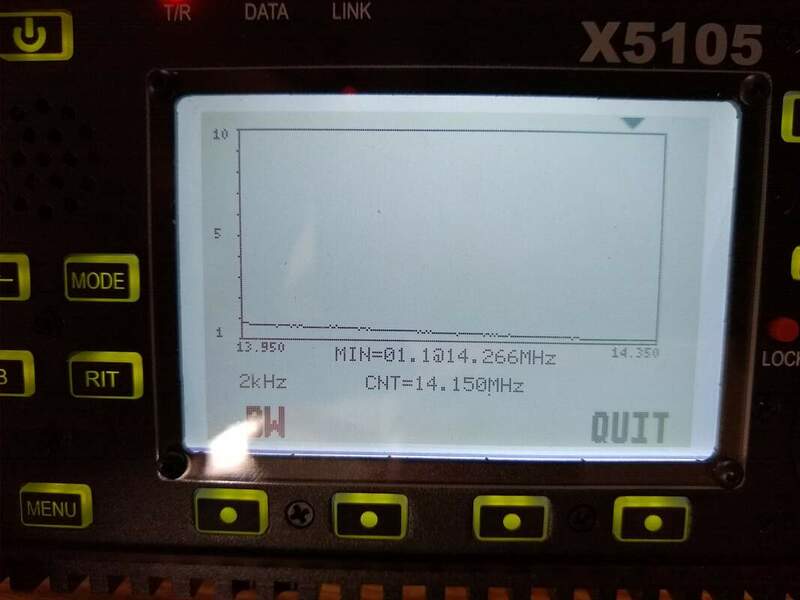 The first part of that was trimming both segments of the antenna to resonance in their respective bands, 7.052 on 40 and somehow I failed to write down the 20 meter segment frequency! Then I tried the full 40 meter length on 20 meters. It works nicely. In spite of the fact that it's 20 meter resonant frequency is 14.5mhz the SWR is below 1.5:1 across the band. After trimming there was a 1:1 SWR with or without a ground wire to a short ground stake. With just the 20 meter portion I noticed a very slight increase in resonant frequency without the ground but 1:1 SWR in both cases. It is erected as an inverted vee with the Apex near the center and 20 ft up. The 40 meter version does also works on 20 with about 1.3:1 SWR. It's resonant frequency is at about 14.5mhz and 7.05 on 40 meters. But it works nicely on both bands. Worked WA (1700 miles) on 20 using the full 40 m length, USB with 5 watts this afternoon and MT (1300miles) this evening on 40 CW. Sketch of construction of my EFHW 20/40 meter inverted vee. 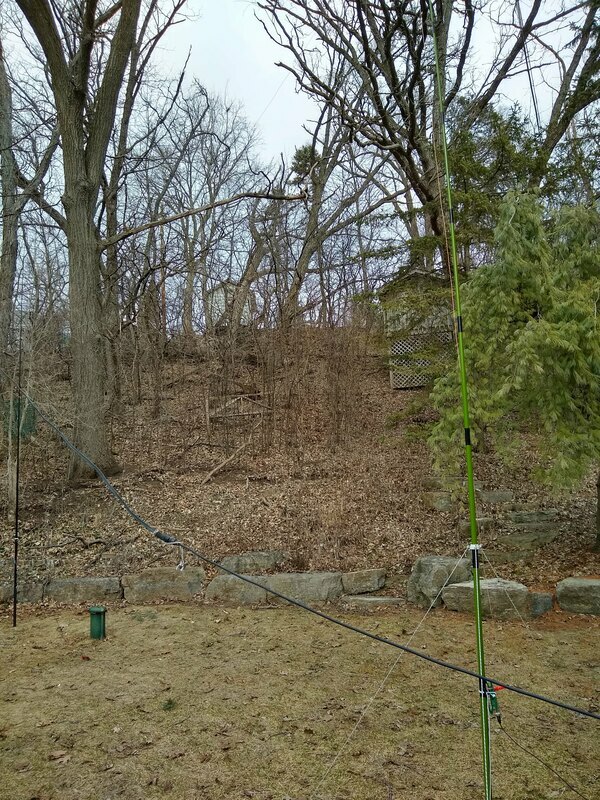 2019-03-21 Late yesterday evening, just before dark I added the 34' extension to my 20 meter EFHW wire. Actually had a nice, solid % watt QRP QSO with 579 reports both ways with KB4MNG in NC on 40 meters with it. But it rained and the SWR went crazy so that ended my experimentation or the night. But today I put everything up again and did some tests. The two photos below show the result of a short ground wire tied off of the transformer. As they show the resonant frequency is shifted higher by the addition of the ground. The ground I used was a 4 foot piece of wire clipped to a 7 inch aluminum tent stake at the foot of the 3 ft post supporting the transformer. EFHW extended for 40 meters and without a ground attached to the transformer. EFHW extended for 40 meters and WITH a ground attached to the transformer. 2019-03-20a After the successful deployment of the 20 meter end fed half wave antenna today I've decided to work on an extension for 40 meters. Since the element is currently 28' 10" long, I need to add another 34' 6" feet to it. 2019-03-20 Today is the first day of Spring but it sure doesn't feel or look like it. No sunshine and about 43 degrees! Oh well, still nice enough to get outside and play with my QRPGuys No Tune End Fed Half Wave Antenna. The radiating element is 28ft 10in long. I set it up both as an inverted L and as a sloper. Twenty meters is up and down so it's hard to say much about how they compare for operating. But I did notice one important difference. The resonant frequency is quite a bit lower in the sloper configuration than as an inverted L. I'm not sure I trust the center frequency reported on my x5105 graphs of the two but the graphs themselves are pretty close and tell the story. The difference is enough to require one to be alert when setting them up and using them. In both configurations the connection point and the QRPGuys transformer was three feet off the ground. The corner of the L on the inverted L was 15ft up and the tip was a about a foot higher. In the Sloper configuration the far or tip end of the radiator was about 15ft up and the feed point at three ft. The feedline was a ten foot section of RG-174 for both of them. The connections inside the house were also identical. With the inverted L configuration just before lunch I had a short 5 watt SSB QSO on 14.252 with N4WQB in Merritt Island, FL, 1072 miles. He gave me a 42 report and was 58 in here. He was running a linear but I don't know his power out. After lunch using the sloper I had a short 5 watt SSB QSO on 14.300 with KK5QT in TX, 1052 miles. He gave me a 55 report and was 59 in here. Again I don't know his power setting. But both configurations work. I didn't notice any hand capacitance or RF in the shack. 2019-03-18 Today I discovered that the ground has thawed deep enough to push a tent stake into it. 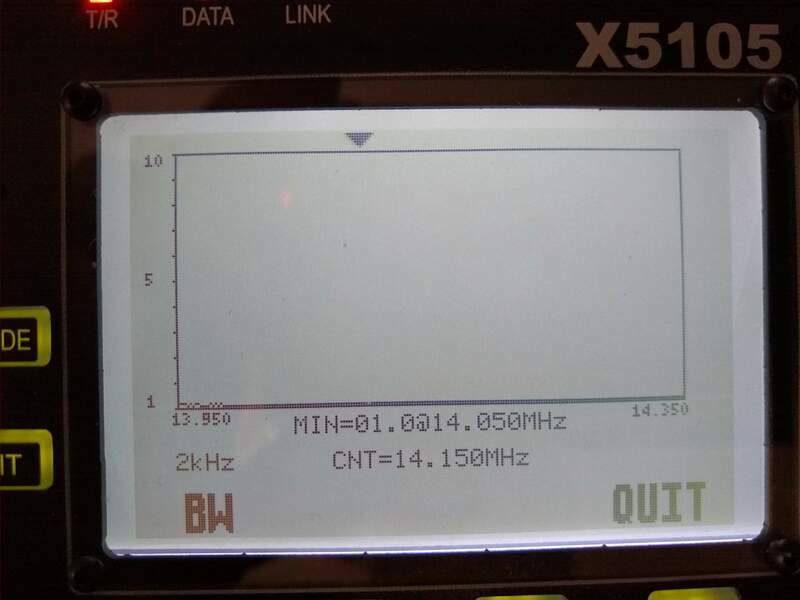 So I set up one of my push up masts and strung up the QRPGuys No Tune End Fed Half Wave Antenna with the 20 meter element I had been playing with discussed below. To my amazement its resonant frequency was very low, about 13 mhz! After shortening it I got it up into the lower end of the 20 meter band. But compared with my G5RV it seemed to do very poorly. I also noticed some RF getting into my shack. I played around with feedline lengths and added a counterpoise. Neither gave me satisfactory results. Not sure what is going on with that! I then put up my 35 foot end fed antenna. It seemed to tune up just fine on all bands but again, compared with my G5RV was unimpressive! So I then went with my four band trap inverted vee. It seemed to work a little better but the resonant frequency of the 30 meter segment is way too high. Again not too sure what is happening as the SWR looks quite a bit different from the last time I played with it. I was getting tired of antennas so kind of gave up for the day. It's possible I have the ends quite a bit higher than previously. So tomorrow I'll experiment with that. 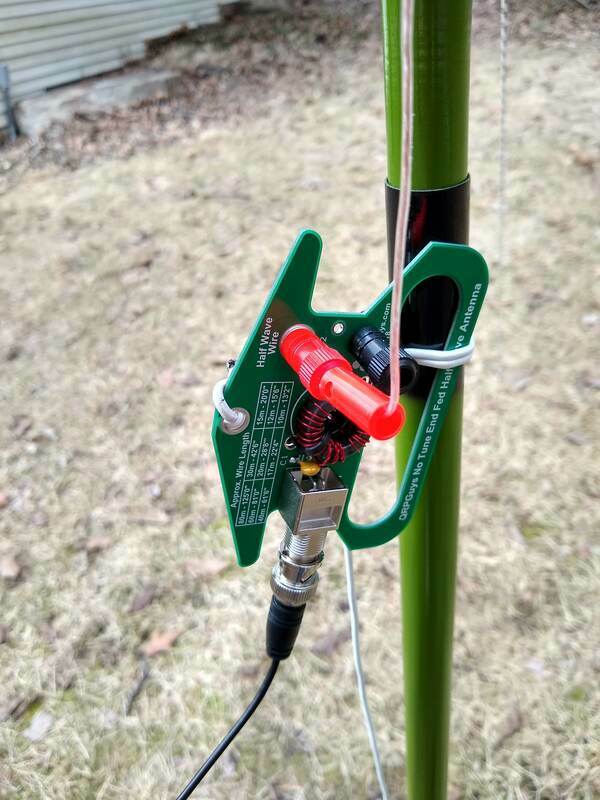 2019-03-13 Before pursuing adding a linked extension for 30 meters to my 20 meter end fed wire I decided to do a bit more testing. Primarily I wanted to decide whether the length I have the 20 meter portion is what I want. To make that decision I probably need to play with different angles of the wire or how high the far end is above the ground. So I strung the antenna up inside (outside is a bit rainy today). The driven end was about three feet off the floor and the far end about seven feet. It ran through a very open part of the house so no walls or other things were closer than about five feet or so. The floor is above a four foot crawl space so the wire is at least seven feet from any actual ground. The SWR, resonant frequency and usable bandwidth was very similar to the test yesterday outside. But what I did notice was considerable impact from hand capacitance. The RG-174 coax from the transformer to the radio was about four feet long. I played around with some short counterpoise wires to see how that would change things. They did change the resonant frequency and some lengths pretty much did away with the hand capacitance. Then I tried a 25 foot feedline without any counterpoise and the hand capacitance was gone! At that point I ran out of time and I'm not sure I trust those observations. I think I need to do more testing, probably with a more typical installation. Antenna experimentation never ends! 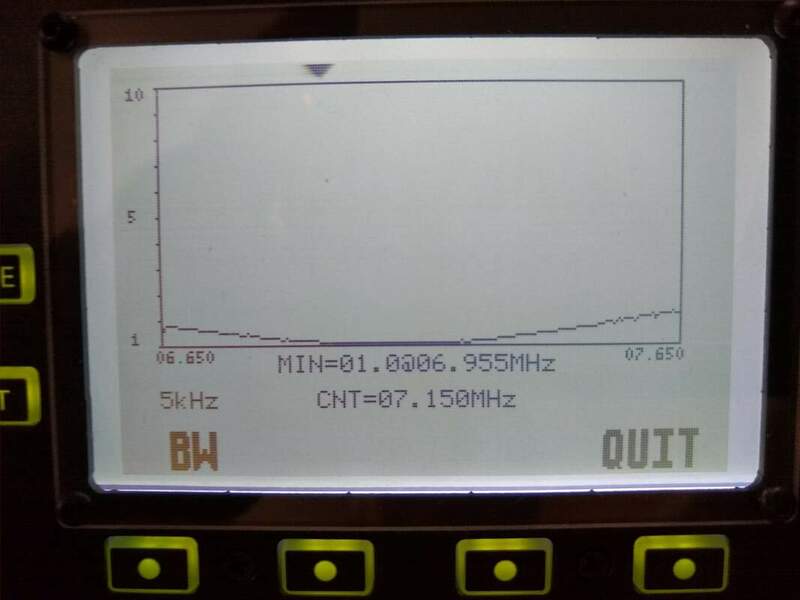 First Test of QRPGuys end fed half wave antenna transformer. Good SWR across most of the 20 meter band with a 28+ft radiator. 2019-03-12 The temperature rose to about 45 today with nice, bright sunshine! What a day. So I took my newly completed 49:1 end fed half wave antenna transformer from QRPGuys outside and strung a 28+ foot #24 speaker wire from the transformer to the peak of my garage. It was a hastily done thing so not very impressive but according to my x5105 the SWR was near 1:1 across much of the 20 meter band. I failed to take a photo of the SWR graph. The band had several SSB QSOs and a few CW ones. QSB was fairly heavy. The maritime mobile net control operator on 14.300 in Houston, TX was very strong but he was busy rag chewing with a bunch of guys and never gave opportunity for me to even call. I think he could have heard me since he was peaking at nearly S9. It's frustrating when a net control doesn't provide many opportunities for check-ins. But I'm happy that the antenna looked to the radio exactly as I hoped. Weather permitting I will keep playing with it and eventually experiment with a linked version covering at least 40 and 20 and probably 30 meters too. I may use connectors rather than aligator chips and forms between the sections of the radiator. We'll see. 2019-03-11 Today, the package containing the QRPGuys No Tune End Fed Half Wave Antenna transformer kit arrived. After dinner I'll get to work on it. And equally encouraging, the weather seems to have made a change. They are predicting at or near sixty degrees on Thursday! That feels like it's been a long time coming! My completed QRPGuys No Tune End Fed Half Wave Antenna transformer. Ready for a field test! 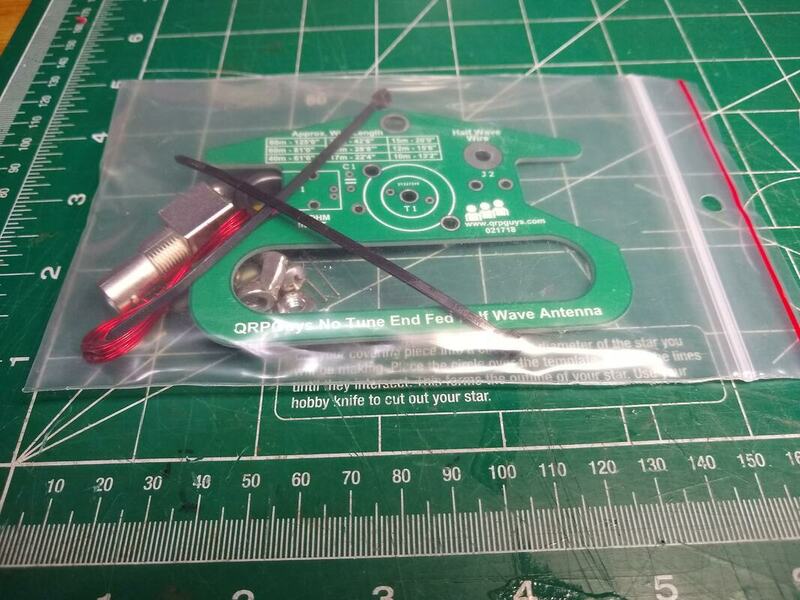 QRPGuys No Tune End Fed Half Wave Antenna transformer kit as received. At left is my completed QRPGuys No Tune End Fed Half Wave Antenna transformer. It took about an hour to build. Haven't had opportunity to check it out yet. Perhaps tomorrow. 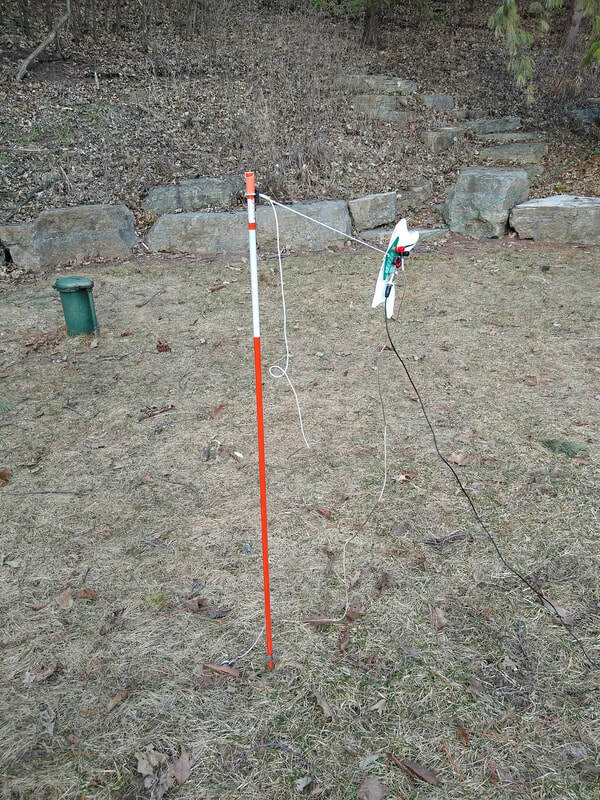 2019-03-01 While waiting for my QRPGuys No Tune End Fed Half Wave Antenna transformer kit I decided to cut a 20 meter element. According to their information it should be 28.8' or 28' 10" long. I'll cut a piece 29' long to give me a few inches to play with. I will use inexpensive 24 gauge RCA speaker wire for the initial tests. Then if all works out well, I'll cut more permanent pieces from the small gauge wire from Sotabeams. All this to help pass the time while the snow doesn't melt! 2019-02-28 I'm assuming that someday it will once again be warm(ish) outside here in southeast Wisconsin. With that assumption in mind I keep thinking about setting up outdoors and playing radio. Of course antennas is the major focus of that thinking. I've been watching a number of YouTube videos while I'm on the treadmill in the early morning and end fed antennas make up a larger percentage of the antenna types guys use for POTA (Parks on the Air), SOTA (Summits on the Air) and other outdoor portable activities. And of those, the end fed half wave is one of the favorites. 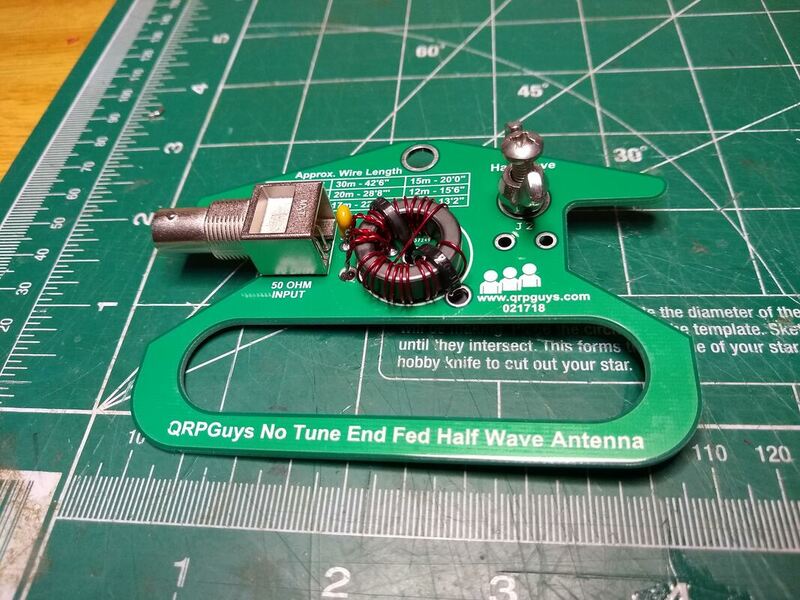 So the QRPGuys No Tune End Fed Half Wave Antenna has been capturing my attention for a while. It's such a simple design that I'm almost embarrassed to think of buying rather than building one but on the other hand for it's low price it hardly makes sense NOT to buy it and save all the messing around involved in making one. (How's that for the logic of spending twenty bucks!) So last night I ordered one! 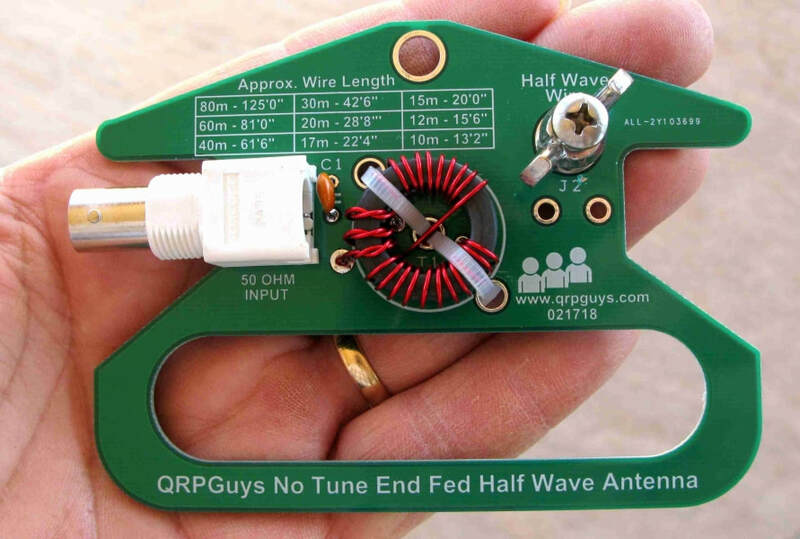 QRPGuys End Fed Half Wave Antenna. (Photo from their website). Part of what pushed me over the edge is the idea of combining that with the concept of a linked dipole which at least conceptually, provides a fairly easy way to change bands. Like the link dipole, simply lower the wire enough to reach a link and clip the leads together or separate them and bingo, you're on another band. And if you set it up in an inverted vee configuration it is as simple or simpler to deploy than a linked inverted vee. Simpler, actually, as you only have one link to mess with rather than two for a link inverted vee. One other advantage would seem to be the possibility of using a much shorter coax feedline than with an inverted vee, since it is fed at the end rather than at the middle. That also offsets one of the primary advantages of a random length end fed which can be used on multiple bands with a tuner. And theoretically, the EFHW doesn't need a tuner! So on the surface it seems like it would have all the advantages of a full sized dipole over both the random wire or inverted vee antennas and none of their disadvantages. I'm anxious to get it built, have a nice day and give it a whirl. I'll probably start with one link allowing a 40/20 meter configuration set up as an inverted vee with one fiberglass push-up mast. The main issue one must deal with to use an end fed half wave antenna is the approximately 2000 ohm impedance it presents to the rig at resonance. One really simple approach is to use a transformer with the antenna connected to the parallel tuned secondary and the transmitter connected to the untuned primary shown at right. I found a great, practical web site on the subject by M0UKD that I highly recommend. After putting a hay-wired version together on my bench I spent several hours experimenting and had a nice 559 QSO with another QRP station (I was running about 4 watts) in Pennsylvania. The antenna went from my shack's window sill about 4 ft above ground out to a tree reaching about ten feet at the far end. I didn't even have a counterpoise on it. I later did some checking of resonant frequency and impedance of the half wave wire itself using a short counterpoise. Initial results were encouraging and 20 meters seems to be very manageable. Completed end fed half wave matchbox in a tuna tin. Several years ago I played with end fed half wave antennas and built such a "tuner." It worked but I was never fully convinced that I had done an adequate job of testing it out and the SWR was not great. So I decided to disassemble that one and be a bit more systematic in my approach, and try again. My goal was to build it into the tuna can I used before. It just looks cute! My first one included a Tayloe SWR Indicator/Bridge then offered by QRP Kits (link below) and I wanted to include it in the new one. The finished product is shown at right. Using a 2200 ohm resistor as the load which reasonably well simulates the impedance at the end of a half wave antenna at resonance I measured less than 1.5:1 SWR on both 40 and 20 meters as indicated by my Z11 Pro ii tuner in bypass. The photo at left shows the inside of the completed tuner. The transformer at the top of the photo consists of a 3 turn primary and 17 turn secondary (see schematic above). Both windings are air core wound on a pill bottle, about 3/4 inch diameter and 1 3/4 inches long. After winding I used a hot glue gun to run four beads of glue along its length, roughly evenly spaced around the coil and then removed it from the bottle. I wound and glued the 17 turn secondary first and then when it was cool added the 3 turn primary and glued it. As the schematic shows the primary and secondary are not electrically connected. The ANT/GND connector on the right is floating, not connected either to the can or to the primary ground on the coax input connector. Some articles suggest a switch to allow the ground end of the secondary to be connected to the primary and coax ground providing a "counterpoise" from the coax, rig, etc.. I did not include or experiment with that. www.qrpkits.com/swrind_case.htmlThe XMTR terminal on the left is a coax connector. The center pin goes to the xmt input pad on the Tayloe SWR bridge circuit board. The ant pad on the bridge circuit board goes to one end of the three turn transformer primary. If you don't want to include an SWR indicator as part of the matchbox then simply connect the center pin of the coax connector directly to the "hot" end of the 3 turn primary winding. The ground end of the primary winding, along with the ground pad on the Tayloe SWR bridge circuit board (if included) are connected to the coax connector ground which makes physical and electrical connection to the tuna can. So the tuna can itself is connected to the coax shield coming from the transmitter. I mounted the transformer to the bottom of the tuna with two layers of double sided foam tape. That keeps it about 1/8th inch off the tuna can bottom but rigidly in place. The switch to connect the 220 pf capacitor shown in the schematic for 40 meters is a simple SPDT toggle switch. I connected the wiper to the ANT (hot) end of the secondary with the capacitor soldered from one switch contact terminal to the ANT/GND end of the secondary winding. I used a SPDT switch just in case in the future I want to add a second capacitor for another band. A SPST would suffice for just 20 and 40 meters. The schematic of the completed matchbox is shown at the top of this page. The secondary winding consists of 17 turns of #16 enamel wire with a 3/4 in. outside diameter and about 1.74 inches long. It measures about 2 uh. The primary is three turns of the same #16 wire. Both coils are held in place by strips of hot glue, a technique I discovered some time ago which is easy and effective, if not beautiful! The variable capacitor is an old one from my junk box with a range of about 7 to 100 pf. To resonate the secondary on the 40 meter band I switch a 220 pf capacitor across the variable capacitor. Well "everything works" to some degree or other! Just after completing construction I turned on my FT-817 to listen on 40 meters. Many strong stations were calling CQ SKCC so I gave it a go with the power set at 5 watts. A very strong station back east heard me but couldn't copy my whole call. Then one in Illinois, only about 35 miles away called. He gave me a 559 report! I switched to the G5RV and tried the eastern station again with no response. Then using my IC-7000 and G5RV and 25 watts he gave me a 579. I think two things were in play. 1) the end fed half wave is only about ten feet above ground so is essentially a NVIS antenna giving a very short range. 2) the band wasn't great. I normally run around 25 watts for my CW QSOs, only increasing power when absolutely necessary. If propagation is there I get through, if not.... So not a conclusive test but interesting. I need to try getting the end fed half wave a bit more vertical and see how that works. The next night I tried responding to a variety of stations on 40 meters who were calling CQ as part of the North American CW QRP Club Sprint. It was fun to hear the band so full of CW. I managed to snag one QSO with a station 134 miles away using 5 watts. No one else even knew I was in the world. 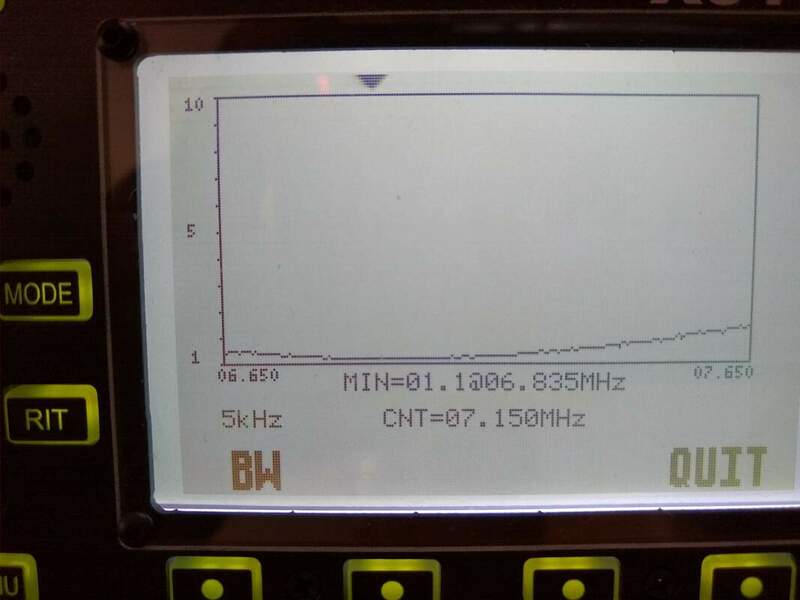 His signal was very strong and he gave me a 599 (not sure if that was real or just the "normal" contest report), but compared with more distant stations, there wasn't much difference in the received signal level on the half wave compared with any of my other antennas. Here are notes on a few more QSOs with it. 4/15/15 Had another 40 meter QSO this morning with a station over in Michigan approximately 250 miles away. Started out well. He was running 75 watts I was running 5 watts. He initially gave me a 569 but that quickly faded to where we had to quit as he couldn't copy me. I was still copying him at about 559 when we signed. I switched to my G5RV but he couldn't copy me on that either so I think 5 watts was just not enough power for conditions. 4/27/15 10:15 am Just had an SSB QSO with N9AER, control operator for Midcars using my FT817nd at 5 watts, powered by a 2200 mAH LIPO airplane battery and the end-fed half wave antenna and matchbox described above. Distance was about 150 miles. He was coming in S8 to S9 and gave me about an S5 report. Propagation seemed pretty good overall as I was hearing nearly everyone checking in very well, even the mobiles. This is making me think again about taking the FT817 on the upcoming backpacking trip even though the package would way about four pounds including the antenna. 4/27/15 11:25 am Had another SSB QSO via Midcars with W9MOE up in NW Wisconsin, about 300 miles. He was S8 and gave me about a 51 report. Have to say this is encouraging. 5/2/15 9:00 pm Just had a qso with KD8TUR using the FT817 and the End Fed Half wave. Lasted about 15 minutes. He is about 330 miles south East in Ohio. He gave me a 589 and he was a solid 599 here in Wisconsin. Toward the end signals were dropping but he still got my SKCC number just before we signed! I had the radio on internal battery and the voltage was showing right at 10v. Clearly if propagation is right this setup works. But that is not news. Probably could have used my dummy load tonight! I want to sling a rope up high in a tree in the yard and get the far end up in the air and see how it works. right now the far end is probably no more than 15 feet above the fed end and it follows the slope of the hill in the back yard so is really only about six feet off the ground of the hill itself. I nearly hung myself on it this afternoon mowing the yard! 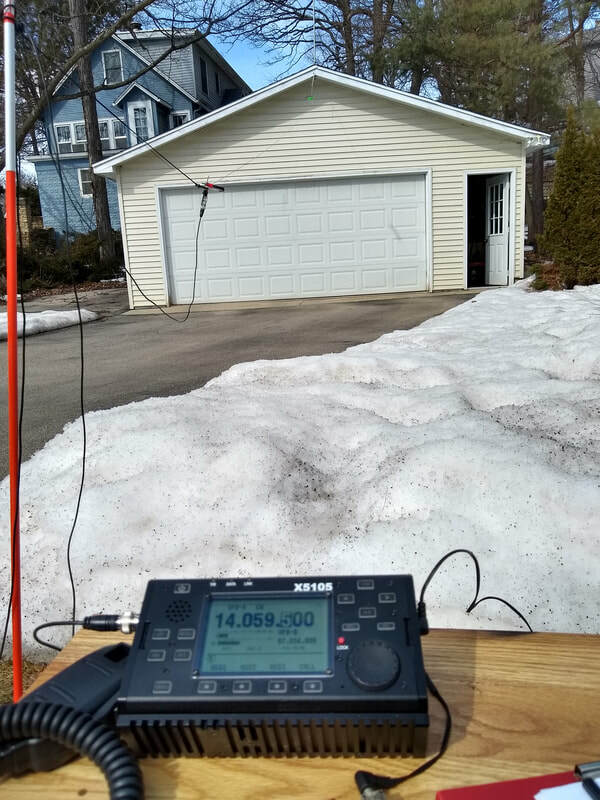 5/9/15 Using my 33 ft. end fed half wave wire tied to my Tuna Tunah II I worked several stations in the SKCC Weekend Sprint (WES) this afternoon between 4:00 and 5:00pm, all using my FT817nd on internal battery. The furthest station was W7GVE which QRZ shows is just under 1500 miles. I switched back and forth between the Tuna Tuna II and my homebrew half wave matchbox and though I couldn't do immediate comparisons I couldn't tell any difference on receive between the two and both gave a 1:1 or at least very low SWR as indicated by both LED indicators on both tuners and on the FT817. The antenna as currently configured goes from the window (about 4' above ground) up into a pine tree with the tip probably about 20' up. 5/11/15 Tonight, again using the end fed half wave and Tuna Tunah II I worked Three more stations at five watts. VE2PID in eastern Canada on 20 meter CW gave me a 579, N5PAB on SSB in Mountain Home, Arkansas gave me a 53 and and W2IRK in Tennessee gave me a 56, also on SSB. I want to put the 51 ft wire on the tuner now and try that for several days. I'm feeling much better about the prospects of this type of setup, given the QSOs I had with it over the past week. In Conclusion: Overall I am happy with the results of my matchbox and matching half wave wires. It is a simple and effective approach to driving end fed half wave wire antennas. The positive things about it are that it is relatively simple to build if you have access to a good variable capacitor and some wire. The biggest negative is that it is essentially single band. By that I mean you cannot use a 40 meter version on any other band as the whole principle is that at resonance an end fed wire looks like a resistance of approximately 2000 ohms which a parallel tuned circuit can quite easily cope with. If you want to work multiple bands you will need multiple wires cut to a half wavelength of the band and parallel LC transformer that will resonate at the desire frequency.